A crowd of HUDS workers, students, supporters, and a live band rallies in front of the Smith Center on Tuesday evening for Local 26, a Boston union that represents hotel and food service workers, including HUDS employees. 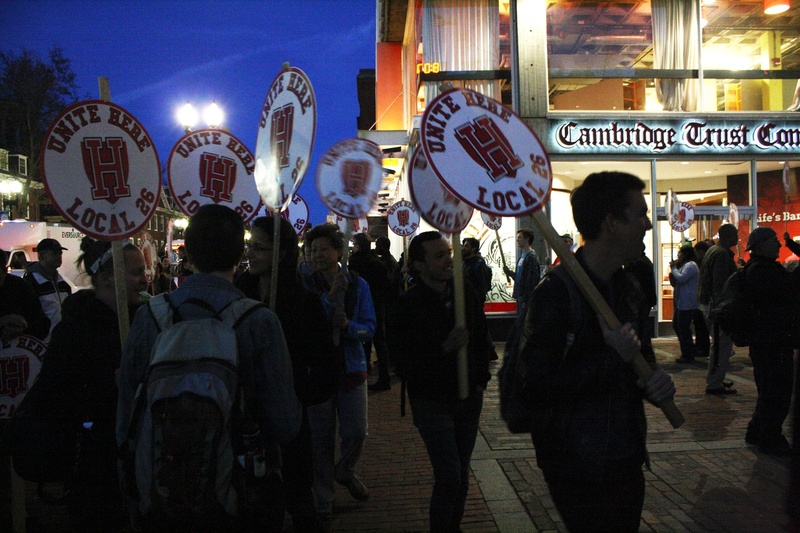 Harvard University Dining Services workers, along with the UNITE HERE Local 26 union and other organizations, hosted a rally around the Smith Campus Center outdoor plaza on Tuesday to launch their campaign for a new labor contract with Harvard Campus Services. The agreement between the HUDS union and the University does not expire until June 2016, but Local 26 President Brian Lang emphasized the importance of early discussions due to last fall’s changes in healthcare benefits plans that have affected non-union University employees and could potentialy Factor into the Harvard Union of Clerical and Technical Workers' upcoming negotiations. In September 2011, Local 26 and the University negotiated a five-year contract that was met with mixed reactions from HUDS employee. While the contract included an annual wage increase of 2.73 percent and the establishment of a joint committee to monitor workplace conditions in dining halls and oversee the sustainable foods program, it left out other important demands, such as year-round work for dining hall employees. “There is no reason why an institution with this wealth and this level of intelligence cannot engage with dining service workers to remedy the problem of diminishing incomes among dining service workers on campus,” Lang said. Nearly 100 people attended the kick-off rally, ranging from current HUDS employees to other members of Local 26 to Harvard students. For the first half hour of the scheduled rally, picketers marched counterclockwise around the Smith Center outdoor plaza to the tune of an eight-person band consisting of Local 26 union members. For the second half of the rally, Lang, members of the Local 26 union from Harvard and other Boston universities, as well as Harvard students spoke, expressing their energy and vigor in kickstarting the contract campaign. Fatima Leighton, a HUDS employee in Annenberg dining hall who spoke at the rally, echoed Lang’s comments and also pointed to this past winter to highlight the need for reforms in the contract relating to hazardous weather conditions. “What I really want to see in the next contract is better language for us so that when we have a blizzard, we can stay home and not have to use our vacation time,” Leighton said. Lang did not give a specific timetable for negotiations, but said that his union has attempted to reach out and establish dialogue with Harvard. —Staff writer William C. Skinner can be reached at wskinner@college.harvard.edu. Follow him on Twitter @wskinner. After failing to agree to a new contract for dining hall workers, the University and UNITE HERE! Local 26—the union which represents the workers—have agreed to extend the current contract until September 12. The contract was originally slated to expire today. Harvard and UNITE HERE Local 26, the union that represents campus dining hall workers, reached a tentative contract agreement Thursday. A lawsuit brought against a local Boston union is anticipated to have no effect on the union’s upcoming negotiations on behalf of Harvard University Dining Services staff or its ongoing representation of Harvard Club of Boston employees. ​Last week, Harvard’s dining hall workers voted overwhelmingly in favor of a strike after more than three months of stagnant contract talks. But this is not the first time UNITE HERE Local 26, the union that represents HUDS employees, has brandished the threat of a strike in the face of static negotiations.